Super lightweight waterproof neoprene material with water bottle holder. 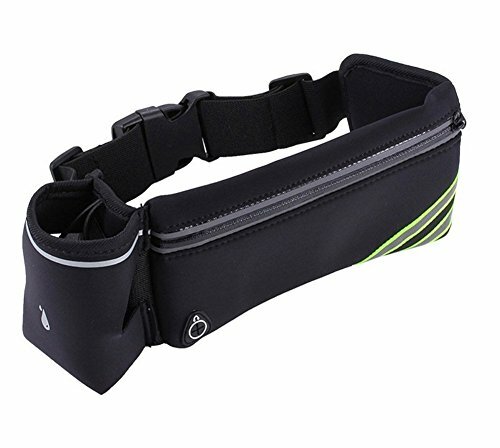 Adjustable strap fits from 25'' to 50'' waist. Large zipper pocket for your phone, money, keys and more. Reserved hole for your earphone cable come out and let you enjoy the music when your phone or mp3 in the pocket. ADJUSTABLE STRAP- Fully adjustable to accommodate waist from 25" to 50". Water Bottle Holder fit up to 20oz bottles sturdy during your running. NEOPRENE MATERIAL- Water resistant and light weight, ensures all your pocket stuffs stay dry even raining. Machine washable and quick dry. LARGE ZIPPER POCKET- 4"x 8" pocket size compatible for iphoneX,iphone 8plus, Galaxy S9+, Money and coins, Keys and other stuffs. RESERVED EARPHONE CABLE HOLE- A hole for your earphone cable come out and let you enjoy music when you are running. LIFETIME GUARANTEE- 90 days hassle free money back service, lifetime quality warranty for any issues. Manufacturer: Dongguan Yuantu Sports Industrial Co., Ltd. Publisher: Dongguan Yuantu Sports Industrial Co., Ltd. Studio: Dongguan Yuantu Sports Industrial Co., Ltd. If you have any questions about this product by Fabmore, contact us by completing and submitting the form below. If you are looking for a specif part number, please include it with your message.